Due to Novell’s increasing dependence on Microsoft, it has become rather difficult to distinguish between Novell and Microsoft. Both companies are motivated by some similar ambitions and therefore they help one another. In reality, Novell helps Microsoft a lot more than the other way around, so it’s hardly a reciprocal relationship. Novell gives Microsoft business whereas Microsoft gives Novell ‘FOSS bills’ to pay. Quite ironic is that fact that Novell, a contributor to OpenOffice.org, is harming the very same project it purports to be helping. Have we mentioned that the front page of OpenOffice.org used to link to BotcottNovell.com for a couple of months? Watch what Novell is still doing for Microsoft, based on this new article from the Asian press. In concert with the efforts to promote interoperability between the two platforms, Novell also announced support for the Office Open XML file formats in their version of the OpenOffice.org productivity suite. Mind the word “their”. When Novell says "their", one can also interpret that as “Microsoft’s & Novell’s”. It serves both companies, as though they have become a collaborative team that strategises together. Remember our writings about what seems like a Novell fork of the project [1, 2] and consider other related observations [1, 2]. Sun Microsystems, being a FOSS control freak, must not be too thrilled about Novell’s behaviour. Then again, there are many complex (and sometimes conflicting) agendas, so just like IBM, they ultimately find a way to get along and carry on. “Hundreds of millions in throwaways is small money for a multi-billion cash cow, so Novell truly sold out here.”Novell ‘supports’ OOXML, but make no mistake. It does not mean that it truly believes in OOXML as much as it is obliged (almost forced) to support OOXML. It signed such a contract with Microsoft. Hundreds of millions in throwaways is small money for a multi-billion cash cow, so Novell truly sold out here. It apparently needed the money. “What [Microsoft] is doing with OOXML is to further lock down [users] with dependencies on Microsoft technologies as part of their business value chain,” said Pillay. Microsoft believes that ODF is an elegant standard, which seems to contradict the analysis of its own vassals, the Burton Group's analysts whom it hired for several paid-for gigs. Let’s repeat this headline again. Then use it. 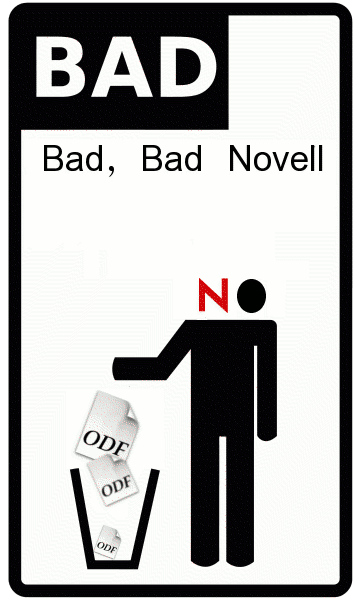 Remember that ODF is already the one and only international standard. OOXML is an attempt to ‘complement’ the standard with an application and an entire operating platform (Microsoft Windows). Rob Weir has more to say about what was once described as the fragmentation of OOXML (too many versions).